SCALE CONTROL SYSTEMS FOR WATER HEATERS, TANKLESS WATER HEATERS, EVAPORATIVE COOLERS, MISTING SYSTEMS, COMMERCIAL WATER HEATERS AND BOILERS. From simple water filtration systems for restaurants to scale control and multi-stage systems for tankless and commercial water heaters, boilers, cooling systems, we can design a customized product to fit your needs. Scale control has become a critical component for protecting pipes and water systems in many areas of the United States where hard water reeks havoc and limits the life span of anything where water travels through. Protecting your investment can be something as simple as a single housing system with a proven scale inhibitor media such as Siliphos® manufactured in Germany and NSF-approved. The tankless water heater industry has proven this to be a valuable asset in protecting their equipment. Boilers and commercial water heaters sometimes require larger systems such as water softeners to protect. Check out our standard systems or fill out our inquiry form for any customized products you need. Our ScaleZERO scale control systems are proudly manufactured in the USA. Point-of-use systems installed at the cold water line right before the water heater. 5-micron polyester pleated sediment filter with the proven genuine Siliphos® scale inhibitor down the center allows for higher loading capacity, increased particle removal, lower initial pressure drop and higher flow rates. 2½" x 10" system with ¾" ports (8-10gpm). System protects the water heater and other parts against corrosion from limescale (minerals). Includes pressure gauge, bracket, hardware and housing wrench; housings UV-protected. 4½" x 10" system with 1" ports (15-20gpm) for larger and commercial tankless water heaters. 2½" x 20" system with ¾" ports (8-10gpm). System protects the heat exchanger and other parts against corrosion from limescale (minerals). Port and gauge threads have lead-free brass inserts to prevent leaking, cracking and mis-threading. Includes pressure gauge, bracket, hardware and housing wrench; all housings UV-protected. 5-year warranty on housings; 1-year warr. on gauges. 2½" x 10" system with ½" ports (3-5gpm). System protects the evaporative cooler pads and parts and misting system tubing against corrosion from limescale (minerals). 5-micron bag filter with Siliphos® scale inhibitor contained in a 20" tube down the center; allows for timed release dispersal. Filter removes dirt, sand, rust, sediment, and protects the boiler or water heater against corrosion from limescale (minerals). Designed for flow rates from 45-50 GPM. Polypropylene NSF-certified vessel (BUNA): housing, lid, cartridge plate, lid gasket & plate gasket (BUNA). The vessel is top loaded with a special threaded lid and gasket; filter elements can be changed without disassembling the sump. Pressure rating: 100 PSIG @ 110ºF. Approximate weight: 10 lbs. Port Size: 2" NPT. Optional differential pressure gauge available; call for pricing. Standard System: four 5-micron polyester pleated sediment filters Siliphos® down the center. Filters remove dirt, sand, rust, sediment, and protects the boiler or water heater against corrosion from limescale (minerals). Four-round 2½ x 20" cartridge vessel with 304 stainless steel construction and poly-coat finish (exterior only). 2" NPT side in/opposite side out with 150 PSIG rating; ¼" NPT vent; ½" NPT drain/gauge ports (2). Universal seat cups, v-posts, & cap/spring assemblies. Heavy-duty welded mounting legs (3); band-clamp closure with Buna-N seal. *Custom sizes also available; CALL for pricing. U.S.-mfd light commercial reverse osmosis water purification system is ideal for restaurants where larger quantities of purified water are required for drinking and cooking. 2½” x 20” system with 3/8” ports for increased flow rates. 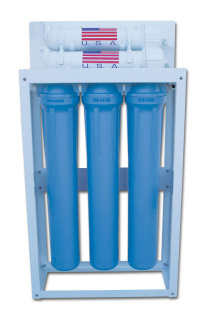 Five-stage system contains one-sediment and two-carbon block pre-filters; two-100 GPD RO membranes and post carbon filter. 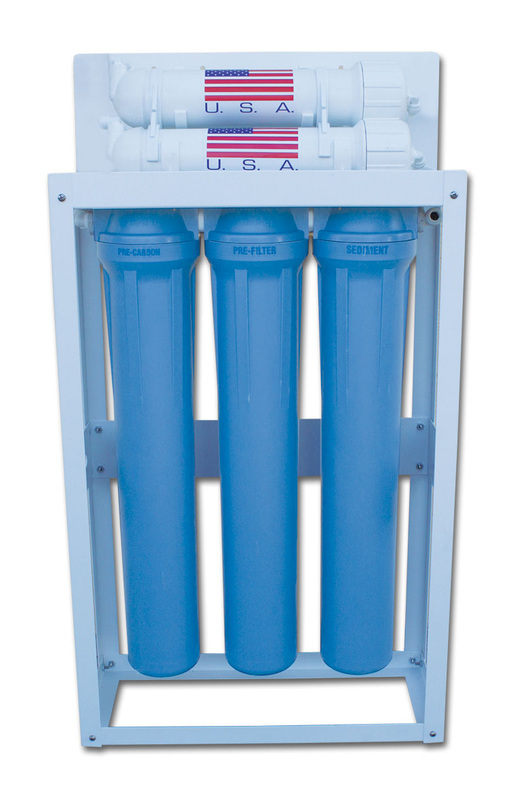 RO systems reduce or remove over 98% of most contaminants found in fresh water. System is frame-mounted with white powder-coated steel frame. System includes all color-coded tubing, pressure regulator, connectors, faucet. Comes with seven-gallon storage tank; available in other sizes. Also available with booster pump for greater flow rates and larger sizes; call for pricing. 2.5"x20" pleated poly sediment and Siliphos® filter. For stainless steel system, order four filters for standard system. 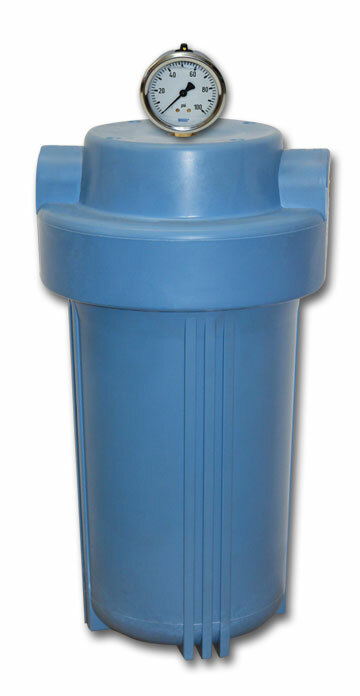 4.5"x10" pleated poly sediment and Siliphos® filter. 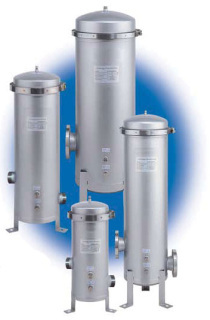 Commercial water softeners can be utilized for a variety of applications where high flow rates and other capabilities are required. Potential industries include hotels, motels, apartment complexes, car washes, food service and food preparation, hospitals and other medical facilities, hydroponics and gardening, ice production facilities, laboratories, beverage processing plants, breweries and distilleries, electronics and circuit board manufacturers, and irrigation systems. They provide important and valuable protection for equipment, pipes, boilers, water heaters, heat exchangers, and any water appliance where limescale is an issue and soft water is a necessity. When selecting a water softener for any commercial application, it is critical to gather and assess your water consumption needs, the water hardness and any future growth included in the schematics. 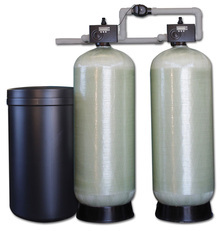 Since every application is unique, we customize our water softeners to your specific application and work closely with you to ensure proper sizing, etc. The system above employs a proprietary valve manufactured by Clack, one of the foremost makers of quality control valves. This valve allows for precise monitoring and includes a floating reserve which calculates reserve capacity for each day based on demand. This ultimately saves the customer on salt usage and water, very critical with systems as large as these. It can also be equipped with a relay switch that can be programmed to reclaim brine. our systems are sized specifically for your needs. Commercial water softeners today are much more efficient than ones in the past. With sophisticated electronic valves used, precise controls can be set to create the best in water efficiency and salt usage for your particular application. We utilize the latest valve technology to ensure the most efficient system for water and salt consumption. We work with the top manufacturers to put together a system for your precise needs. All systems come complete with appropriately sized mineral tanks, brine tank, proper control valve, connectors and distributor. All systems come with a manufacturer warranty. Please call our office, so we can assist you with your next commercial water softener.